I was nearly blind. Enveloping me was a golden murk accompanied by the deafening roar of the angry, howling wind. Lost, I wandered aimlessly, occasionally sprinting left or right to avoid detritus that had been whipped up by the storm and launched at me. At first I felt suffocated, like I was trapped inside a sand-filled snow globe, but as I grew used to it, the world almost seemed peaceful. 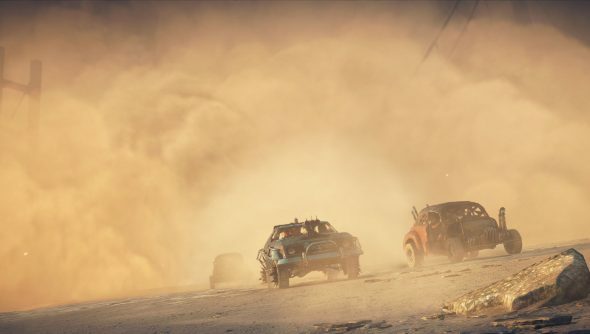 Mad Max is a game about fast cars and big explosions, the end of the world meets destruction derby, but it’s not the petrol and rubber or the gleeful violence that drives me forward, it’s the storms. These huge, monstrous walls of dirt and wind that swallow up everything around them, that’s what I go out looking for. I’m a storm chaser. I’d started to get a little bit bored of Max’s slightly pointless journey to build a fancy car and avenge the loss of his treasured Interceptor, the Black on Black. It’s a surprisingly conservative game that, though admittedly fun for the first five to ten hours, sort of peters out as the game reveals itself to be mostly full of busy work. Then I witnessed my first storm. Many hours had gone by without me witnessing anything new, so the thunderous elemental assault took me completely by surprise. I’d been searching for mines from the uncomfortable seat of a rusty buggy, with a dog in the boot who’d bark when we got near some explosives. I was just finishing up this particularly dismal task when I saw it, off in the distance, a gargantuan cloud building up near the mountains on the horizon. At first the storm almost looked static, though undeniably intimidating and terrifyingly beautiful. It was deceptive, just like a real storm, and before I knew it, I was stuck out in the desert, facing down an elemental titan. Find shelter, the game said. Bugger off, I said back. This was something I wanted to be in the middle of, something new and terrifying and maybe even empowering. I used to be deathly afraid of storms, and it’s always because of the wind. It’s invisible, but has the strength to pick up cars and rip buildings apart, and you’d be mad not to be intimidated by it. During a hurricane-strength gale, I came an inch away from having a slate tile smash into my skull as it flew off a roof. I was no fan of storms before then, but that solidified my fear for a good while longer. Now I find them exhilarating. I don’t know what changed, but I’m compelled to head toward them. That’s probably a danger to my health, but I’m stupid, and I ignore the warnings on cigarette packets, so what’s the harm in some wind? It’s probably for the best that Scotland, while a dark, bleak land filled with foul weather, is rarely home to storms that are more than a nuisance. The Australian wasteland is a lot less hospitable. In the middle of that first storm, I drove around in my buggy, at first trying to get my bearings and then just embracing it. I felt a bit too safe in my vehicle, though, so when a second storm hit, hours later, I took it on free from the confines of my metal sanctuary. I make it sound like I was just waiting outside for the storm, but it took me a bit by surprise. 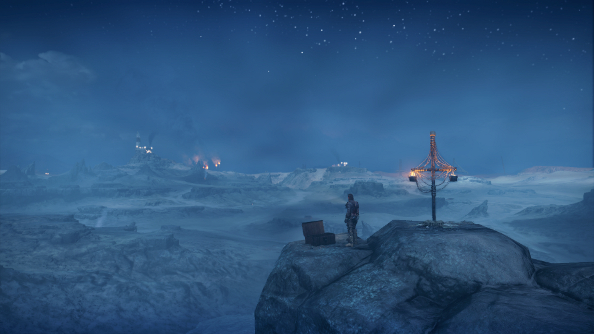 I was scrounging for scrap on some cliffs with an impressive view of the post-apocalyptic world below me. My car was far away, back down in the valley below. That’s when I got the call from my grotesque mutant pal, Chumbucket: a storm was coming. And sure enough, off in the distance was that indomitable wall of sand and fury. Even if I had wanted to get back to my car, it was simply too far away to get to in time. And while that was fine with me, as I wanted to take on this storm on foot, I was still assailed by a sense of vulnerability. There was no cover, just the top of the cliff and the storm that was raging toward me. It hit, and the world changed. Mad Max’s world is a curious place. It’s a desert wasteland, vast and decayed, yet it teems with life and landmarks. Look in any direction and there’s something interesting drawing you toward it, whether it’s a colossal, crumbling statue, a band of roving raiders or a steel container promising scrap. It’s a theme park where the theme is the end of the world. 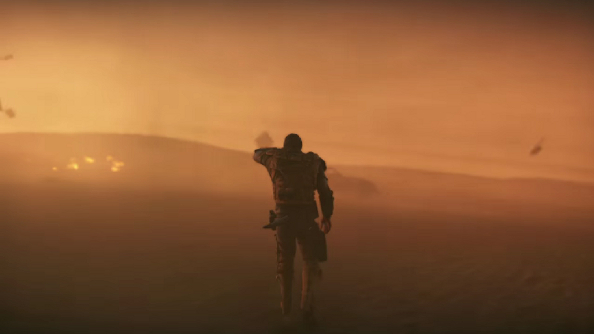 For a game that’s designed to always keep you moving, always keep you heading toward a new task, that makes perfect sense, but it weakens the sense of desperation and isolation that a post-apocalyptic desert should have in spades. The storms change that completely. With your vision limited to what’s right in front of you, with the environment itself becoming your greatest enemy, it finally starts to feel like the end of the world. All of that stuff that makes Mad Max seem to busy to be apocalyptic is still there, but it’s invisible, leaving you alone and completely at the mercy of the elements. I was too busy marvelling at the weather the remember to record a video, but thankfully others have proved to be more prepared. I walked through the storm, battered by garbage and dirt, just trying not to fall off the cliff. All I could see was sand, and all I could hear was the relentless, ghostly howling, until shadows tore out of the gloom. Mad Max’s enemies are not possessed with much intelligence and, being scrawny and emaciated, they aren’t particularly threatening. Again, the storm briefly fixes this problem. As the crazy bastards charged out of the storm, screaming along with the roaring wind as if they were working with it to create an infernal song, I blinked, and for just a moment, I was a bit worried. Ultimately, the fight went as most fights do in Mad Max. They gave me every opportunity to kick their arses, and kick them I did. But that oppressive, intimidating atmosphere made the battle more memorable than any that came before or after. I’m reminded of the surprisingly excellent Assassin’s Creed IV: Black Flag and the challenging STALKER series when I’m in the heart of these storms. Those games too leveraged the inhospitable environment to heighten the sense of risk and helplessness. In Black Flag, it was the savage seas, storms that threw the ocean into disarray, turning the calm azure water into waves as big as buildings. In STALKER, it was the radiation, invisible but deadly, and the effects of anomalies, twisting the world around them, turning a straightforward path into a minefield. 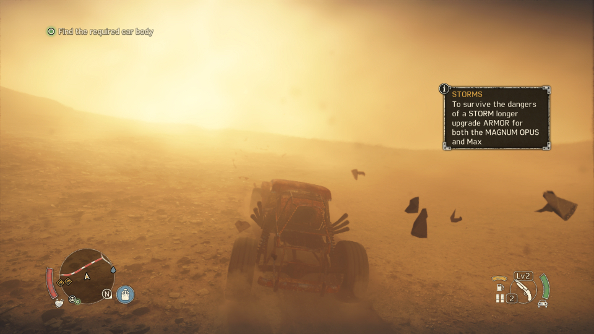 Like those things, Mad Max’s storms are indefatigable enemies. You cannot defeat them, you can only wait a storm out or find a way out of it. They are absent purpose, a whim of nature, but they present a threat more imposing than the more driven foes that assault Max continuously throughout the game.